Children’s burial grounds are so common in Connemara that a person walking the hills or shorelines of Connemara, once he or she begins to recognise the hillocks and dunes packed tightly with stones to mark the little graves, might think that they are spots picked at random or for convenience. This is not the case though. They are situated in places that are of great importance to people since they first came to Connemara. They are situated in places that bind people to their ancestors. There are about forty of these children’s burial grounds marked out on Tim Robinson’s map of Connemara. These are sites where the people of Connemara buried those outside the family of the Catholic Church, unbaptised children, stillborn children, unknown adults found dead during the famine and suicides. The local name for children’s burial ground is cillín or liosín, both of which mean little graveyard. The local placenames of these graveyards, testify to the burial of infants there, Liosín na bPáistí (little graveyard of the children); Liosín na leanaí (little graveyard of the babies); Trá na bPáistí (beach of the children); Cnocán na bPáistí (hillock of the children); Cnocán na leanbh (hill of the babies); Reilg na bPáistí Maru (graveyard of the dead children); Clochar na bPáistí (stony ridge of the children); Aill na bPáistí (cliff of the children); Gaire na bPáistí (The sandbank of the children); Creg na leanbh (The crag of the babies); Garraí na bPáistí (The field of the children) and so on. 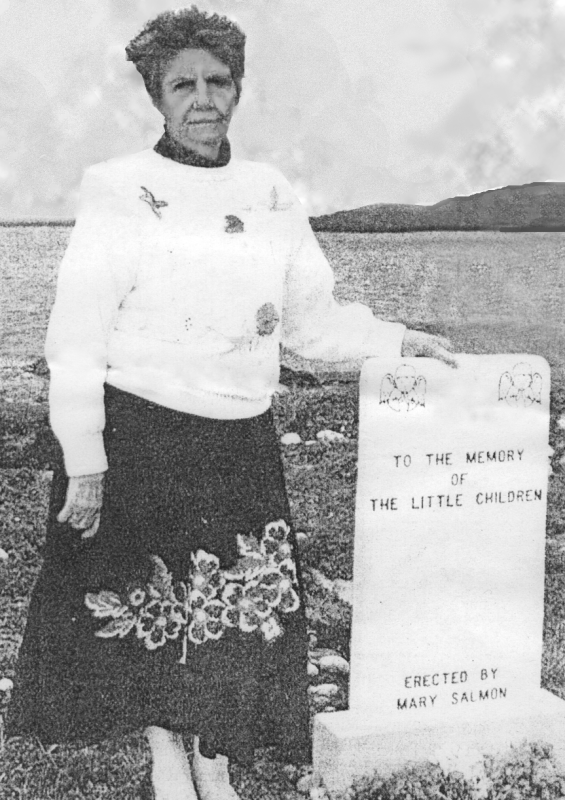 Prayer answered…Mary Salmon by the memorial stone to her two children. The foremost archaeologist to explore the Connemara landscape is Michael Gibbons of Clifden. He has visited almost all of the burial grounds in the region. “Wherever you look, you have them. Connemara has some of the most extraordinary ones. I remember first getting interested in children’s burial grounds when I went to a site in Derryrush on the site of Cnoc Mártán, crawling up through the scrub in a beautiful little valley going into this very overgrown graveyard. It was hard to make out the graves because there was a lot of lichen, primroses and beautiful heather. I remember one grave in particular which stood out above all the rest because it had a rush cross with a red bow on it. I remember standing watching it and thinking there’s some woman out there, an old woman now, climbing up here, probably on the anniversary of the death of her child, going to the trouble of scrambling up the hillside to mark this child’s grave. This was not some anonymous death; she was still grieving. She was still acknowledging that this child existed and had a presence, no matter how short. She had put her marker to her child on this little grave in the landscape and this marker was such a powerful symbol”. or hope that these children who had nothing in life might have something in the afterlife. Their families put them on the edge of the tide in Salerno, on the edge of the mountainous sacred pilgrim route in Maméan, on the edge of a nice limestone ridge in the case of Mweelin mountain and also on the edge of more infertile schist and quartzite rock further down. The location was very important, very site specific. They were tiny, but packed with the simplest graves one has ever seen. The Fountain Hill site, overlooking Omey Island, is probably the most stark in its bleakness, situated on a rounded knoll overlooking the ocean. At the same time it is very simple and well-preserved. It is a beautiful, spectacular spot on a fine summer’s day with the sun beating down on the beach. Contrast this with a bleak January day with its howling Atlantic gales and one would have to wonder at how anyone could bury their children in such a raw, rough place. However, these type of locations were always selected for children’s burial grounds. They were on the outside of the world, so to speak, out of the community. Those who were buried there were regarded as being on the edge of the world, temporally, physically and spiritually. These locations symbolised the state of the unbaptised and expressed the concept of ‘limbo’ – that in-between state, neither heaven nor hell. by Michael Gannon for Connemara Community Radio.